OneNote is part of the Microsoft Office suite, it hasn't been a tool that I use in the classroom a lot, but it has been a tool that I use for lesson preparation and to keep everything organised. Absolutely everything I need to remember, all key information about work programs, units, lesson plans, professional development sessions, and so much more, is all organised in one easy place. One of the key features is that it syncs between my home and work computers via OneDrive/Office365, which is also where I store all of my school resources. Everything is always backed up, so I can't lose it, and everything syncs so I can switch seamlessly between my work PC and my mac at home. As you can see in the pictures below, I love the ability to create hyperlinks between sections in my notebook, which makes it easy to navigate and find everything. While it takes a bit of effort to set up to begin with, it is incredibly useful and easy to use once it's done. It has made my preparation and planning so much more streamlined and efficient! If you haven't already, I highly recommend giving OneNote a go! 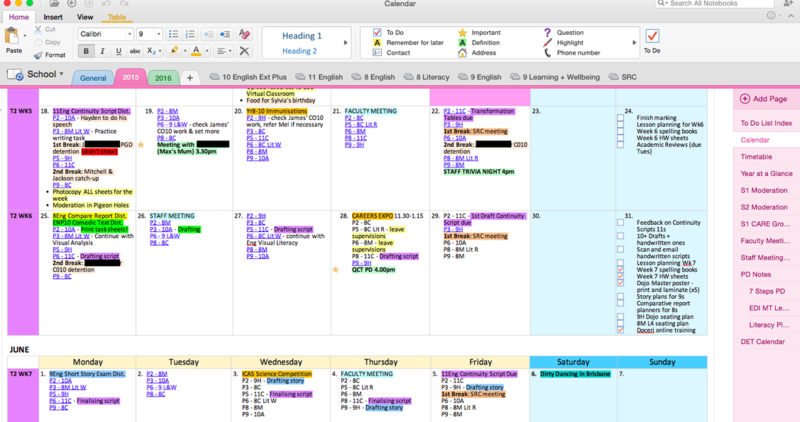 2018 UPDATE: I've previously used Planbook for all my individual lesson planning, as it's slightly more streamlined and specifically designed for teacher planning, but Office365 now offers ClassNotebooks as an educational feature that teachers can use to store notes and interact with students in class around class content. I haven't tried this feature yet, but it's definitely on my to-do list. Another awesome feature that I've been testing this year is Staff Notebooks. Staff Notebooks allow groups within a school, such as faculties or groups of teachers for a subject area, to work collaboratively on planning, easily share resources in an organised and easy-to-use fashion, and keep things like deadlines and dates, and meeting notes accessible and organised for all group members. I'm slowly moving all of my planning across to OneNote and I'm working on encouraging my faculty to get on board with trying Staff Notebooks for collaborative planning and sharing of faculty information and resources.